Heartworms (Dirofilaria immitis)are relatively large parasites that, in adulthood, live in the heart and pulmonary arteries of infected dogs or cats. Dogs and cats acquire this infection when larval heartworms are transferred between infected and healthy animals via mosquito bites. Geographic areas with a large mosquito population have severe heartworm problems. 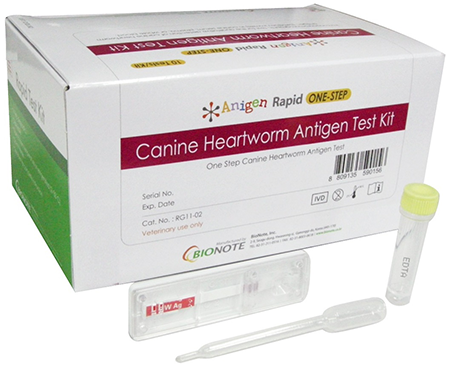 Principles: The ONE STEP Canine Heartworm Antigen Test Kit is a chromatographic immunoassay for the qualitative detection of Dirofilaria immitis antigen in serum, plasma, or whole blood using anticoagulant such as EDTA (see Insert for details). Test performance: Two large scale studies using 109 samples in the first and 174 in the second were conducted. The sensitivity was 96.4% and the specificity was 100% in the first study; the sensitivity was 94.4% and the specificity was 100% in the second study. In a multicentric field trial study conducted in the US, the sensitivity and specificity were found to be 100%. In a study conducted using samples obtained from animals for which adult male worms alone or mixed with adolescent worms, but without any adult female worms, were recovered at necropsy, the sensitivity was 100%.